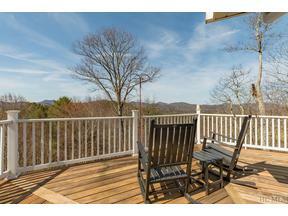 If views are at the top of your priority list, this could be the home for you! Amazing, long-range panoramic mountain views are available from this very well-maintained home in Bee Tree Ridge. Comfortable and charming, the home boasts 7 acres, end-of-cul-de-sac privacy and terrific outdoor spaces for enjoyment of the great outdoors. Enjoy the lush spring and summer landscaping, mostly of indigenous plantings and the fall colors of the mountains beyond. The main level of the home is comprised of living room with stone faced wood burning fireplace, view dining area, kitchen and spacious master suite with office. The large kitchen will be a favorite family and friend gathering space with adjacent keeping room and screened porch. With 4 bedrooms, you'll be able to invite the whole clan to stay comfortably. If you're spending time there yourself, you can easily live on the main level of the home. So private and quiet, you won't believe it. Only minutes to Lake Glenville for boating, fishing or water fun, or enjoy Highlands and Cashiers with the area's many activities, shops, restaurants and other things mountain! It really doesn't get too much better than this...The home must be seen to be appreciated!